All our dogs are fully assessed before being up for adoption. To adopt one of our dogs please fill in the Adoption Enquiry Form and we will get back to you if we are able to proceed with your application. Home-checks apply for all adoptions. Say hello to little Angus everyone who sadly found himself in the pound but now in Radars care. It seems little Angus could be blind/partially sighted, he seems to see movements but relies a lot on smell. Little Angus is already booked in at the vets so we will hopefully have more information about his vision. However we would like to find a calm home that is not to urban so his walks are not in the middle of traffic etc, rural or semi rural would be good. Angus needs a loving and compassionate home dedicated to his needs. He does know the difference of a hard surface and grass and will toilet once on the grass. He travels really well in the car. A home who will provide him with the guidance he needs. A relatively orderly home where things are not left on the floor, furniture does not move too much. A complicated home layout would not suit. It's amazing how resilient blind dogs can be and the ability to cope. If little Angus could make friends with another dog that could be his eyes or a home with experience of blind dogs would be ideal. Angus is such a lovely gentle boy even when taking treats. Angus is not available for adoption as yet as he is still being assessed and his vision investigated. 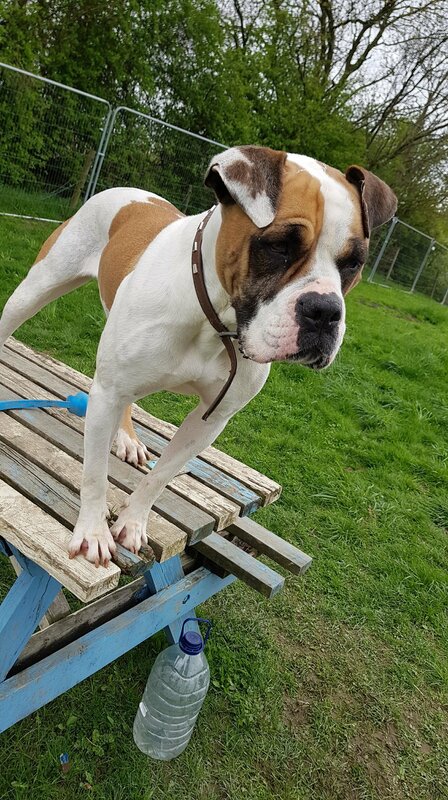 April is new into the care of Radar and it’s hard to believe this gorgeous girl is looking for a new start and hopefully she will not be waiting too long for her forever home. She is a very beautiful girl, good natured and affectionate. April is approximately 2/3 years old and walks lovely on the lead. She travels well in the car and has been fine around other dogs at kennels. April is still having assessments and will be having her vet check. 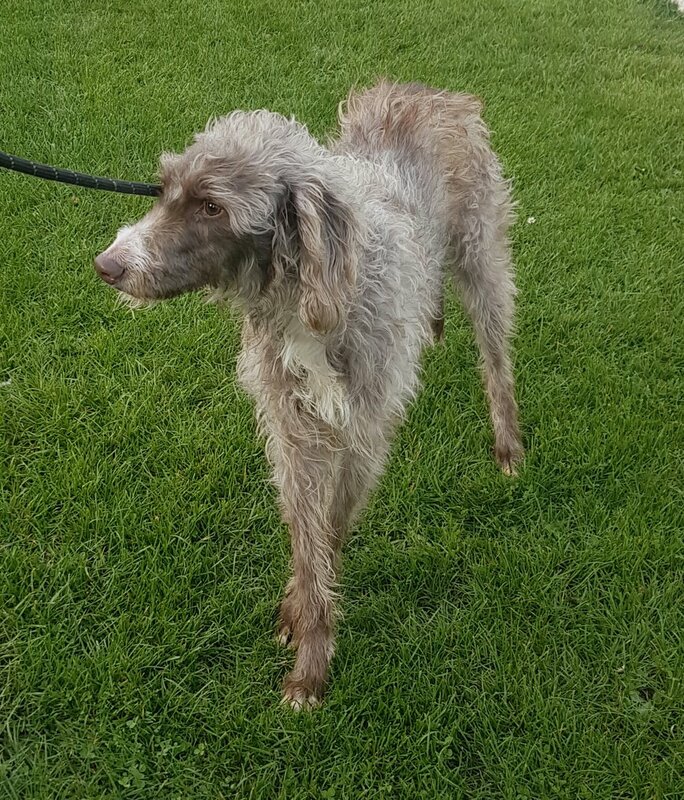 April is a Saluki x and looking for a sighthound savvy forever home. Hello everyone I'm Barney, I am a gorgeous staffy boy of approx 6 /8months old. I am still a puppy and should be out and about exploring the world and learning how to be a well mannered boy but sadly I have found myself in kennels looking for a new start at such a young age. I am a very friendly, lively, bouncy young boy, very bright and eager to please. I would benefit from a home who would enjoy training a dog although I know some basics I am a very quick learner and would love to learn more! An active home would be ideal for me and one where I will not be left alone all day as I am still a young dog and bored puppies tend to chew. I need a home that is going to continue socialising and training. 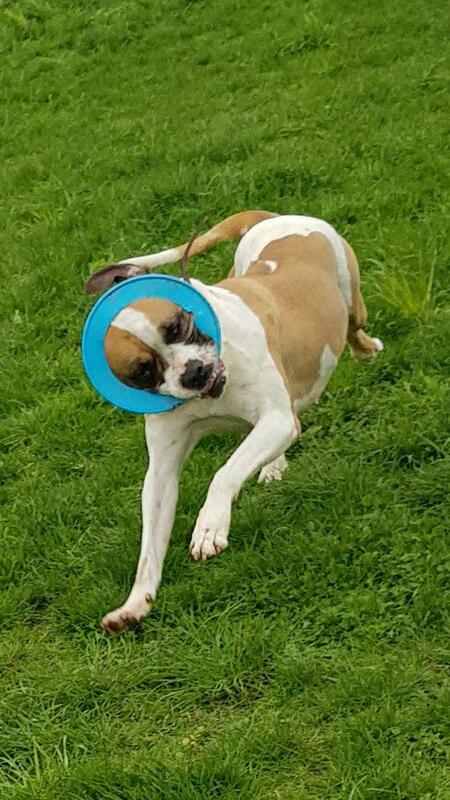 I am a very friendly fussy boy who needs guidance and boundaries snd a fun loving boy who is still a baby. Am I the boy for you? Duke is a handsome young collie x new into Radars care. He is under assessment, a very intelligent boy who knows commands. He will sit and give paw, lay, roll over and turn round. Duke will need a home that can give him lots of stimulation he is eager to learn and happy in doing so. He would thrive in an active but calm home. Duke has previously lived with a cat. We will update his profile as we assess and get to know him more. Families should not underestimate the work involved in helping a puppy-youngster develop into a well-adjusted adult. They need families who are prepared to invest in their development through continued training and to meet all their physical and emotional needs. Note: We only place youngsters and puppies with families who have demonstrated their commitment to a young dog's needs through our vetting process. If you can offer Duke a life of luxury and the walks he deserves then don't hesitate to complete an online application form. Hiya! My name is Trinity and I am looking for a forever home. I am a small legged beautiful brindle Staffy x girl and just love having cuddles. I am very,very sweet with everyone I meet a confident lady that loves to be the centre of attention. I am approx 3 years old and looking for a home that knows their staffies well and can offer me plenty of forever care till I am.old and grey. I have just arrived into radars care and will be having something called ‘assessment'. 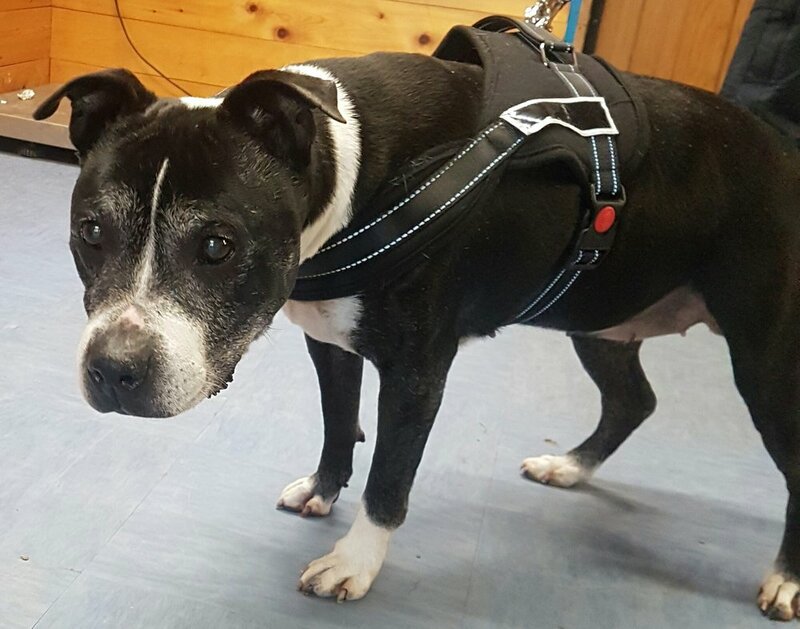 Meet the lovely Wondetful Winnie an elderly staffy lady in desperate need of a home. We were asked to help this beautiful homeless staffy lady as she was passine blood in her urine. Having visited our vet she is currently on antibiotics and is showing an improvement. Winnie was down in the dumps but is now feeling much better and livelier. Winnie is hoping someone out there will fall for an older lady like her. A beautiful lady despite being a little grey around the muzzle these days she has plenty of love to give. She would love to snuggle on the sofa with you.